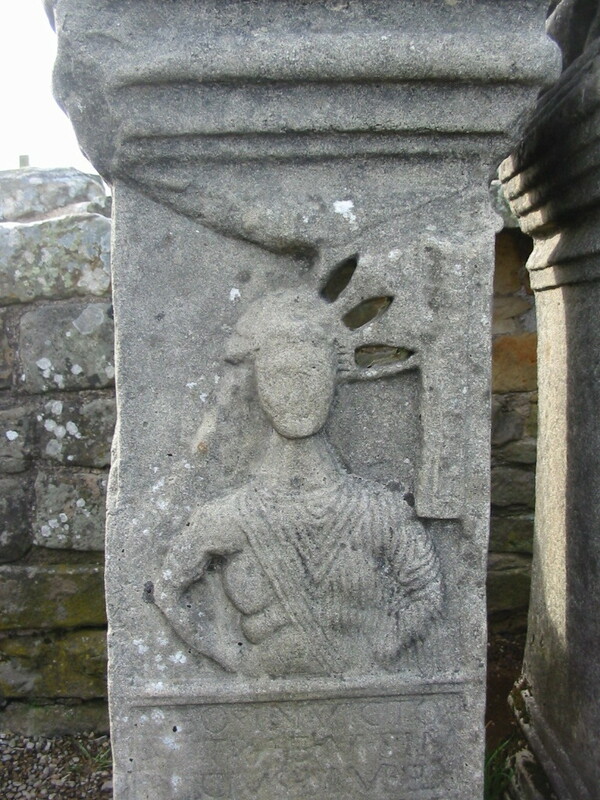 One of three altars of the Carrawburgh Mithraeum – Mithraeum. Our Common Sun. The sides of the die are plain, the top of the capital flat; its face has four leaves with a trisceles in the centre. A cavity 10 ins. wide has been cut at the back of the capital to carry a lamp. On the upper part of the die in low relief is the upper part of Mithras facing front, with arms set at his waist, as he rises from the rock. His cloak covers his body and l. arm; in his r.h. he holds a whip. His head is framed by a panel of ornament, and the rays of his crown are formed by pierced openings through which a lamp, placed in the cavity could throw light. The god's cloak and hair and the inscribed letters retain their red paint, and the panel of ornament has red paint alternating with some other colour, which has worn away. M. J. Vermaseren sees a representation of Sol instead of Mithras.